Making sure my clients get exactly what they want captured is my strongest way of communication. At Sea Pines Resort, in Hilton Head, Sc, you have many varieties of so many locations for that perfect background, The Sea Pines Resort offers an unparalleled setting for your unique and special occasion the lush emerald lawn of famed Harbour Town Golf Links overlooks the Calibogue Sound and bespeaks romance in every beach,with gentle breeze and sunset. The spectacular backdrop of Harbour Town and its signature lighthouse are picture perfect for either an elegant ceremony or reception. Here the clients wanted to have a surfboard theme. Early on that day we rented the surfboards and with my creative juices flowing, while working with the bridal party and the bride and groom, I decided that it looked best the way I posed everyone and photographed the great expression on the bride, this picture has such a great feel, it showcases exactly what the client wanted the bride surfing on the bridal party while the groom looked on. 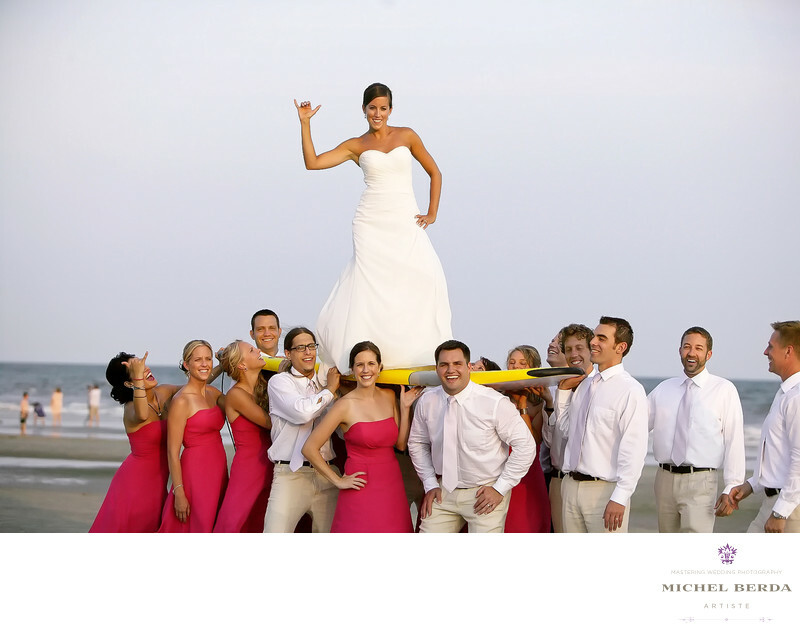 A perfect wedding bridal party with the groom and bride at Sea Pines Resort.